This section of the site focuses on the "Custom-House" sketch, the first chapter of Hawthorne's romance, The Scarlet Letter, which was written just after he was fired from the Salem Custom House in 1849. Ticknor, Reed, and Fields published the novel in 1850 and issued 2,500 copies in the first printing. 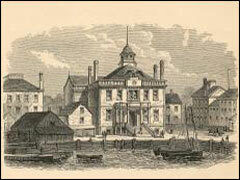 The Scarlet Letter was not a best seller, but the publicity surrounding Hawthorne's dismissal as surveyor at the Custom House was the equivalent of an interview on the "Today" show and boosted initial sales. The original manuscript of The Scarlet Letter is lost, and house printing style was imposed on the 1850 edition, so that version varies occasionally from Hawthorne's spelling, capitalization, and word division in manuscripts of the same time period. As a result, we have chosen to use the Ohio State University Centenary Edition, the one preferred by most scholars, and have purchased the rights from Ohio State University Press. We hope that the hyperlinked version of "The Custom-House" sketch in this section of the site, along with the commentary in the Scholars' Forum, will assist students in understanding the integral relationship between this introductory chapter and the story which follows. Not all publishers in the past have had such an understanding; in some editions "The Custom-House" chapter is omitted altogether. The rationale for this decapitation was that this chapter was merely Hawthorne taking revenge on his political enemies and had no relevance to the story of Hester Prynne, Arthur Dimmesdale, Roger Chillingworth, and Pearl and its themes of moral and artistic freedom. Nothing could be further from the truth.